Rumor has it that servers are important. The truth is that they are the most vital component in any infrastructure. We know that it is never a good thing when production servers go down for any amount of time outside of scheduled maintenance. Companies go to great lengths to maintain and monitor their servers. This is where MSP's come in. Your customers trust you that you know when their systems are down, especially their servers. You can only imagine the phone call from a client informing you that their server has been down for over half an hour and your realization that you did not know. No one wants this to happen. And we do not want this scenario to happen to you. You will first want to update any servers and turn off the options for Offline Maintenance Mode. While simple enough, you will get an occasional email alert when the server is turned off for your regularly scheduled maintenance. This is a far better occurrence over getting caught in the above scenario. Feature Enhancements have been made to the existing 'Data Overdue Cross-check' feature, which you will find on the Edit Site dialog. 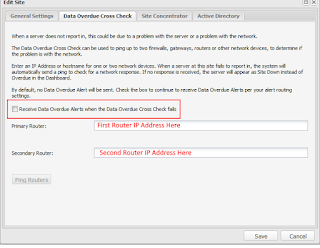 Now present is the option to continue to receive Server Overdue Alerts, even when the Data Overdue Cross Check fails to get a response from the router pings. 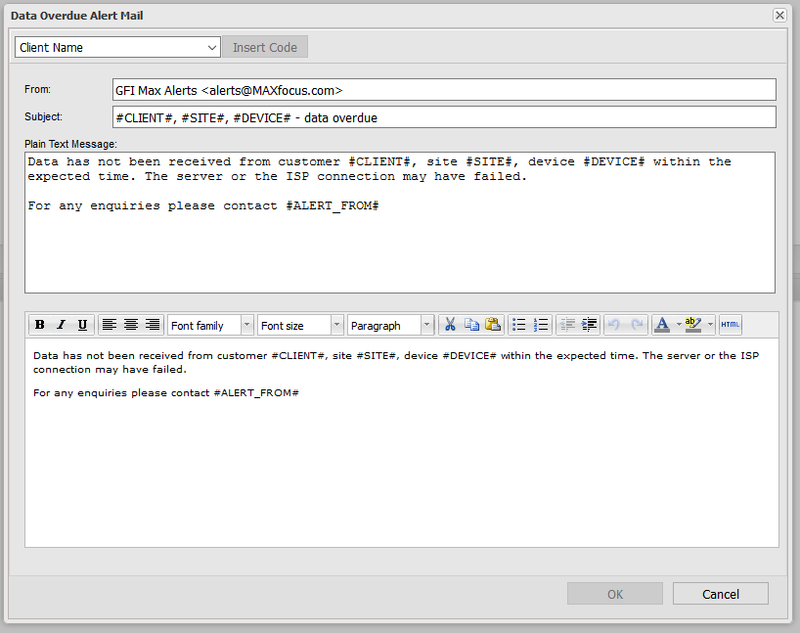 This also means that you can still be alerted in the event there's a network or ISP issue. 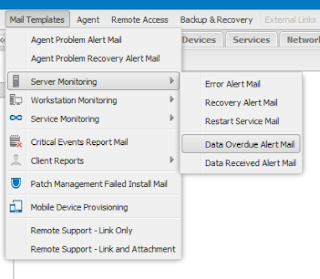 In order for you to know what the issue is specifically, a new code snippet has been added within the Data Overdue Alert Mail template that will update accordingly. If the Data Overdue Cross Check pings respond and all is fine, the status will show as Pass. If the routers can't be reached, the status will show as fail, telling you it's the network that has the issue. 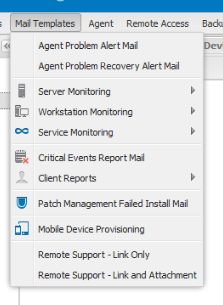 At this point, the device status icon in the Dashboard North Pane and Wall Chart will show the 'Site Down' icon to further indicate that there's a network problem at that site. While working within MSP RMM Cloud, you may have come across a screen for editing sites, and thought "Perhaps I'll fill all of this out..." Given the new changes, it is worth the time to fill this section out. 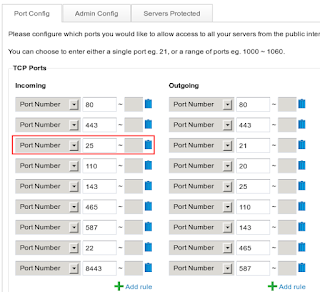 The rationale of this new option is that if the network goes down that there is a network connectivity problem. Unless you live in certain parts of the world where steady Internet is not available, this mindset probably does not reflect the type of service you hope to provide your customers. 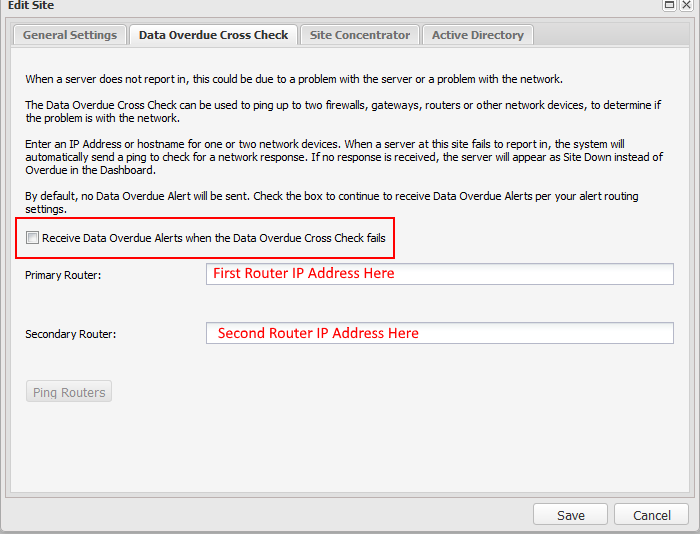 To be most effective, you would want to check the box to Receive Data Overdue Alerts when the Data Overdue Cross Check fails. By completely filling out this section, you have an easy way to monitor Server outages, network outages, and can use the ability to monitor the ISP to ensure that the internet is active for this site. From your perspective, this is a new service that can be provided to your clients. 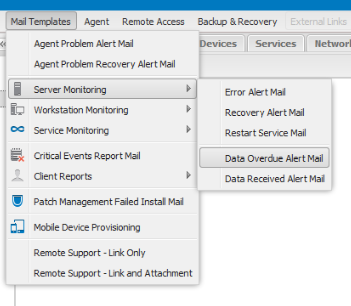 Have you configured your mail templates in the dashboard? 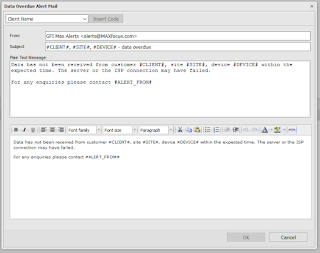 Third, adjust this email alert as needed to maximize the information that you receive. 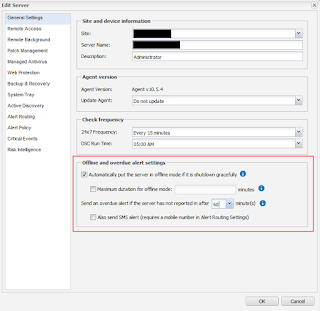 If you are having the alerts addressed from your domain, have you updated your SPF record (if you have one) to include the RemoteManagement servers? Have you taken steps to ensure your spam filters allow these messages to pass through? Once you've gone through this list, the chances of you getting that dreaded call will be a lot smaller, restoring the natural order of things where you are calling your customers first. No matter what the information or its method of transfer, we live in a world where receiving information in real-time just never seems to be fast enough. The idea that the internet brings many various forms of information to our pockets is something that we have become accustomed to. Email is one tap away. So it makes sense that the devices we monitor respond and report in the same way. So.. what's changed? Enter Real-time Architecture! 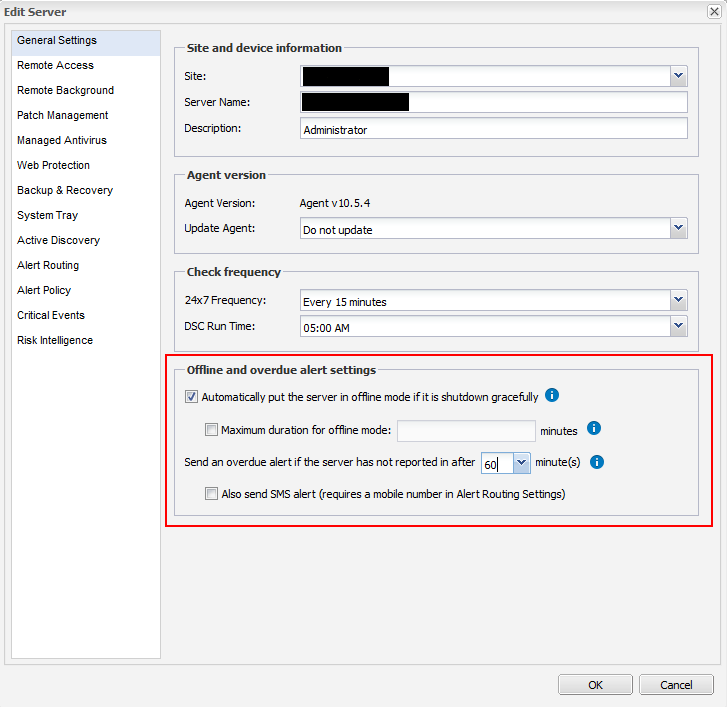 Servers in the MSP RMM Cloud Dashboard running the latest stable Agent have some new features to improve their check-in functionality. This change replaces the previous options that started at seven and a half minutes of reporting. This new system takes advantage of the real-time architecture that was released earlier this year. 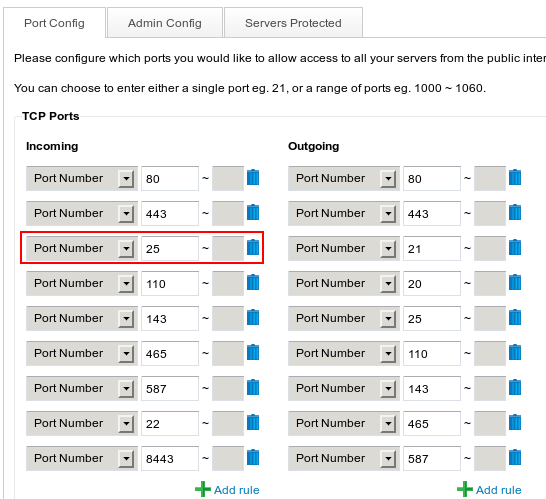 To ensure that your servers are communicating on this faster system, you will need to configure the servers to run at the new 5-minute interval. If they were previously on 5-minute check-ins, you need only ensure that they are on the latest agent. With the changes that have been made to the MSP RMM Cloud Dashboard, you should be able to quickly identify these issues that affect your users and illustrate the value of your services to your clients. Let them know that they can depend on you to handle their issues even before they are aware that they had an issue.